The Russian observers in the Joint Centre for Coordination and Control did not register a single artillery shot by the Ukrainian Armed Forces in the early hours of 27 April. 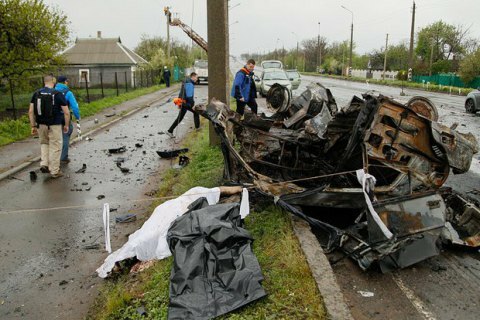 The antiterrorist operation (ATO) HQ has rejected as false the reports that four civilians were killed in Olenivka, Volnovakha District of Donetsk Region on 27 April 2016 as a result of a heavy artillery attack from the southwest. Based on a preliminary analysis of the Olenivka tragedy and the technical specifications of a 82-mm mortar, the HQ concluded that this weapon could not be used from such a distance. "The maximum shooting range of the Podnos mortar 2B14 is 3,000 m, and in the case of the Vasylyok 2B9 it is 4,200 m. The distance between the front position of the Ukrainian Armed Forces' units and the site of the incident is 6.6 km," the HQ said in a statement. Thus, aimed shooting with these weapons could only be done from an area temporarily controlled by illegal paramilitary groups, the HQ said. According to the Minsk agreements, heavy weapons of over 100 mm in calibre, including 120-mm mortars and 122-mm cannons, were withdrawn to the agreed distance. The ATO troops did not move its weapons back to the line of contact, as confirmed by the OSCE Special Monitoring Mission. The ATO HQ described the Olenivka tragedy as a cynical, deliberately planned terror act organized by the Russian occupation troops. To discredit the Ukrainian Armed Forces, the enemy is ready to shoot at civilians in the areas not controlled by the government, the HQ said. The OSCE said that the death of four civilians in the town of Olenivka controlled by Donetsk separatists happened as a result of a heavy artillery attack from the southwest.